With a new report from the IPCC on managing the risks associated with extreme weather and continued weather phenomena attracting media attention, it is important to attempt to get to grips with the science and statistics behind this rapidly emerging field of research. Back in January I posted a story on the current trend to label any and sometimes all extreme weather events as symptomatic of climate change. I argued that a much more rigorous approach is required to understand the links between extreme weather and rising global temperatures. Work along such lines is starting to develop. Some early work was done by Professor Myles Allen of Oxford University following the extraordinary European heat-wave of 2003. His analysis showed that the event lay so far out of the normal 2-standard deviation band around the historical average, that it could be argued that the event would never have occurred without a certain level of background warming. The figure below illustrates this phenomenon. A recent paper by NASA climatologist James Hansen explores the phenomena in considerable depth and shows with some conviction that extreme heat events should be a cause for concern. 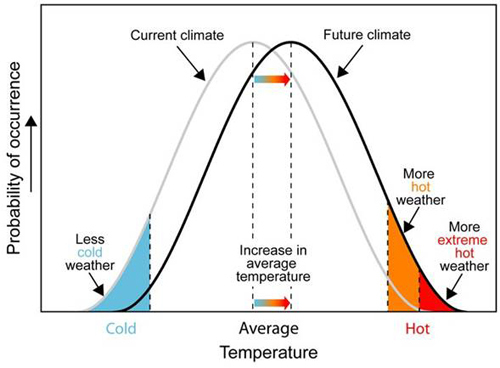 As illustrated in the figure above, Hansen has shown that the distribution of seasonal temperature has indeed shifted, leading to an increase in anomalous events. An important change is the emergence of a category of summertime extremely hot outliers, more than three standard deviations (σ) warmer than the 1951-1980 baseline. This hot extreme, which covered much less than 1% of Earth’s surface in the base period, now typically covers about 10% of the land area. He concludes that extreme heat waves, such as that in Texas and Oklahoma in 2011 and Moscow in 2010, were “caused” by global warming, because their likelihood was negligible prior to the recent rapid global warming. The variability in global temperatures (weather) can be approximated as a normal (Gaussian) distribution, the so-called ‘bell curve’. A normal distribution has 68 percent of the anomalies falling within one standard deviation of the mean value. The tails of the normal distribution decrease quite rapidly so there is only a 2.3% chance of the temperature exceeding +2σ, where σ is the standard deviation, and a 2.3% chance of being colder than -2σ. The chance of exceeding +3σ is only 0.13% for a normal distribution, with the same chance of a negative anomaly exceeding -3σ. 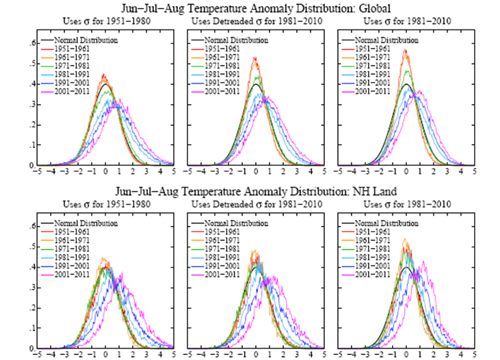 Hansen’s analysis of temperature data over the period 1951-2011 (see figure below) showed that the expected shift in the distribution is actually occurring, with the consequent emergence of a new category of “extremely hot” summers, more than 3σ warmer than the base period. +3σ anomalies practically did not exist in the base period, but in the past several years these extreme anomalies have covered of the order of 10% of the land area. The increase, by more than a factor 10, of area covered by extreme hot anomalies (> +3σ ) in summer reflects the shift of the anomaly distribution in the past 30 years of global warming. One implication of this shift is that the extreme summer climate anomalies in Texas in 2011, in Moscow in 2010, and in France in 2003 almost certainly would not have occurred in the absence of global warming with its resulting shift of the anomaly distribution. In other words, we can say with a high degree of confidence that these extreme anomalies were a consequence of global warming. Hansen has concluded that the extreme hot tail of the distribution of temperature anomalies shifted to the right by more than +1σ in response to the global warming of about 0.5°C over the past three decades. He goes on to say that additional global warming in the next 50 years, if business-as-usual emissions continue, is expected to be at least 1°C and that in that case, the further shifting of the anomaly distribution will make +3σ anomalies the norm and +5σ anomalies will be common. The chance of summer falling in the “hot” category of 1951-1980 is now about 80%. This change is sufficiently large that the perceptive person (old enough to remember the climate of 1951-1980) should recognize the existence of climate change. While the perceptive person may be starting to recognize that things are not what they were (even the NBC News anchorman recently commented after reading a weather story, “It sure wasn’t like that when I was a kid”), it remains unclear how long it will take the general public to recognize that change is underway. An increased incidence of +5σ events may well trigger such a reaction, although such a change may not be apparent until the 2020s or 2030s (assuming a shift of one standard deviation every 15+ years). Is the first offer the best? Climate change has apparently been underway for as long as we are able to analyze it. The recent warming has apparently been underway since ~1650, the trough of the Little Ice Age. However, it appears highly unlikely that a one sigma change will occur during the 15 year period beginning in 2000, based on the last 12 year’s data. I was interested to note that you chose not to identify the climate change as anthropogenic; and, that you chose to put Hansen’s assignment of causation in quotation marks. Such caution, particularly regarding Hansen, appears to be warranted. Based on this logic extreme cold should be less likely. It is good to know as I live in Scotland and any warming is beneficial. As everybody knows the warming is happening mainly in the northern mid latitudes and more on land than on sea. So it appears that big parts of the Earth won’t benefit from this warming.